i still need to start the first book in the series! great pick! I just bought the first two books in this series today! Can't wait to start reading them! I haven't read any books in this series, but it seems to be huge. Thanks for the info on the newest one. Sounds pretty intriguing. I just read the first book in this series and now I'm waiting to get the next one! so far so good! Thanks for sharing this! I haven't read this series but really want to! Great pick! 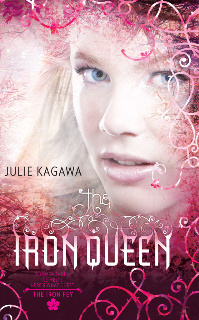 I still need to read Iron Daughter but I loved Iron King so I am sure I will be wanting the third in this lovely series too. The cover is lovely but looks quite familiar - is there a book in this series with a silver cover? Love the cover too. I haven't read the other book in the series...yet! I want this one real bad too! I can hardly wait to see how this trilogy ends. Lovely cover. I hope when you get your books, that you will enjoy it as much as you hope to. Wanna see what I am Waiting On Wednesday for? Alison someday soon have got to get my hands on the entire series too, all the books are so well thought of and sound like really good reads! Hope you get a chance to read it soon! I hear great things about this series! I'm waiting for this one, too. I liked the first better than the second in the series, so I'm hoping this third one improves, instead of continuing to go downhill for me. I am wowing over that one too! I am just WOWing over the cover of Janet Fox’s new book, Forgiven, check it out on my blog! The cover is amazing!!! I love!!! Read the series everyone. They are awesome. Don't let the first part of bk one put you off, it seems a little young to start with, but soon matures. I hate the idea that Megan gets dragged away from Ash, but he'll get back with her at the end - won't he? I'm really hanging out for this one.